Bradgate Park, a medieval deer park in Charnwood Forest in Leicestershire, barren, rugged and reputedly the birthplace of the short-lived Nine Days Queen, Lady Jane Grey, before Bloody Mary got ticked off with the Tudor usurper and tried for high treason, eventually losing her head over it, all before the age of 17. No wonder her house is in ruins. Not sure what I can give in way of an explanation for mine. 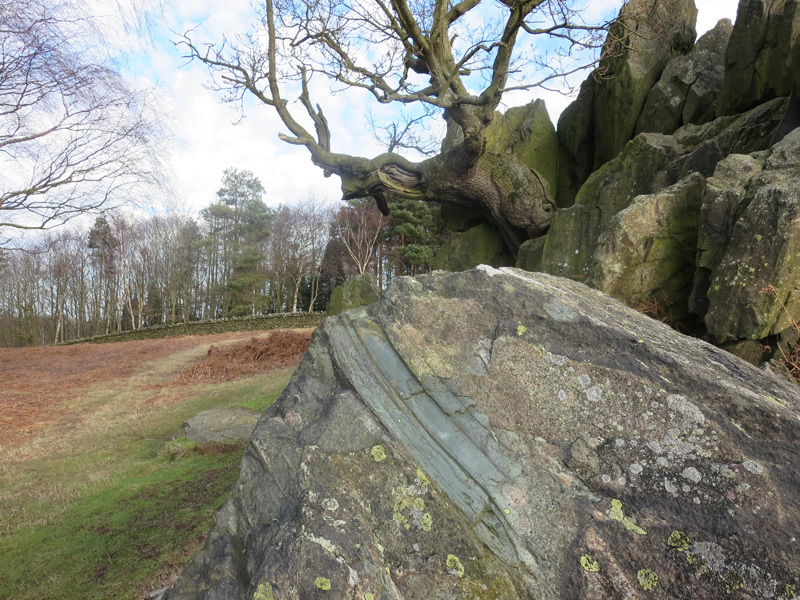 Old rocks and Old John, Bradgate Park in Leicestershire. What we’re really here to do is extreme dog walking. At least that’s the pretence I’ve used to visit here. It’s ripe for it though, there are some hills here, helped enormously by the craggy knolls of Precambrian rocks of volcanic origin, we’ve got a dog, usually a decent enough excuse for a dog walk, trees, deer, muddy paths, screaming kids, howling wind and acres and acres of wild grassy spaces. Note to self: never underestimate dogs ability to sniff out every blade of wild grassy heathland unmolested by others dog’s pee for him to accurately deposit his own it. 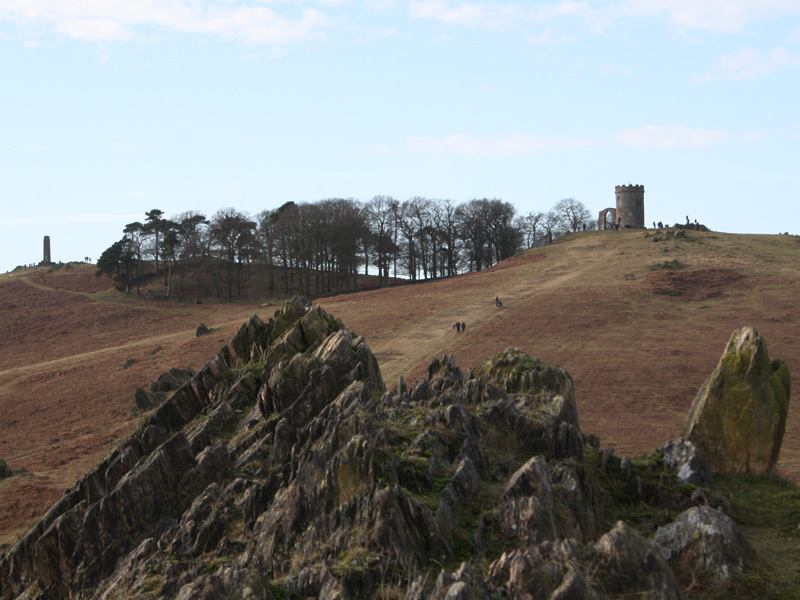 It’s also got a central focal point atop the highest point in Bradgate Park in the form of a folly called Old John, built in 1784, ideal for when your calf muscles are screaming at you from your extreme dog walking if you can get up the hill. I’m not suitably dressed for it though, I’m slogging through thick cloying mud in white trainers, and with every step weighing me down by the accumulating peat and marshy mud dragging me ever closer to a boggy demise. I’m in danger of fast becoming Leicestershire’s very own Pete Marsh (Lindow Man), in fact, if I’d have trodden any further to the east I’d have become Pete-Bog-Horror Man (Peterborough…geddit?….Hint…Google Maps). And they say french Knights had a tough time with the mud at Agincourt. Of course, what I really to do, and the whole reason for the pretence of extreme dog walking, is to geek out and look at those interesting rocks, the sliding stone stump breccias and ancient Precambrian rocks. These Precambrian rocks, 600 million years old, are some of the oldest in the UK and the world. Now you could argue that all rocks are old, but allow me to divulge. Over 50 years ago, it was generally accepted that life, particularly multi-cellular life, not just your odd single cell or groups of cells, emerged during the Cambrian age, the so-called Cambrian Explosion, where in geological terms, life exploded onto the scene and where most of the major animal phyla appeared as indicated by the fossil record. Sliding stone stump breccia, Bradgate Park, Leicestershire. Scientists had always thought there wasn’t any point looking at these rocks, but in 1956/1957, a few schoolkids found marks and impressions in the rocks. These marks on the Precambrian rocks were eventually checked out by a geologist and new species was catalogued – Charnia, named after the forest in which it was found in and can be seen in Leicester’s New Walk museum. The first macrofossil to be discovered anywhere in the world in Precambrian rocks. This led to scientists in other parts of the world to look at other similar aged rocks. These fossils are so old that scientists cannot find the distinction between plant and animal life. All this happening where we are walking now. While Leicester has often given me the impression that it is devoid of life, I have worked near here after all, there are certainly a few old fossils here. Sadly the fossils are not easy to see on these rocks and we didn’t get to see any. Even worse is the fact parts of these Precambrian rock faces have been vandalised, carved with graffiti and souvenir hunters have tried to hack away for a keepsake. They are not the kind of rocks where fossils will come out, they just shatter. For this reason, the site is kept secret although groups may request in advance with the Bradgate Park Trust. Something I’m still keen to see. You can see my earlier attempts at fossil hunting here.